The Berkeley Chess School offers Friday Night Chess classes for grades 1-12 at The Berkeley Adult School in Berkeley, the Grace Presbyterian Church in Walnut Creek, and Country Club Elementary School in San Ramon, throughout the school year. Classes are 90 minutes in duration from 5:30-7:00 p.m. Class is followed by a free optional tournament from 7:00-8:00 p.m. which gives the students an opportunity to gain tournament experience. We offer a Novice class at the Berkeley and Walnut Creek locations. Children must be at least five years old to attend these classes. The Novice class is one hour long, and they can not participate in the tournament. All children must attend the first night of class in order to join the Novice class. 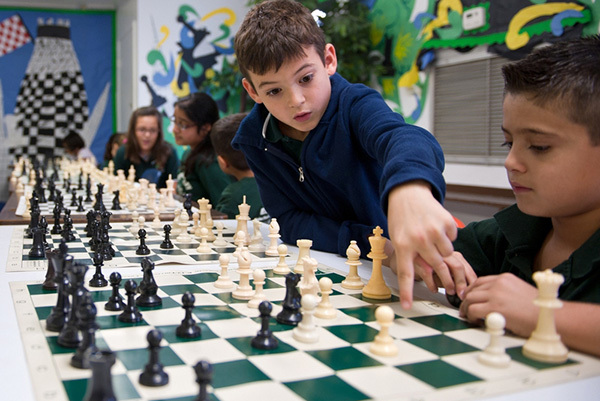 For the San Ramon location, all students must know how the pieces move and have an enthusiasm for chess. There is no Novice class in San Ramon. All children must have completed kindergarten, and please note that all young children are accepted on a provisional basis. We offer an early bird discount if you register early. The discount will end at midnight the Sunday before the first day of class. Friday Night Standings are posted here!